Because California is still experiencing a severe drought, I've been finding ways to be extra mindful about water use. One of my solutions to use less water is to stop buying water intensive crops that are grown here. Because I live zero-waste, I rely heavily on bulk foods for cooking, baking, and snacking. It just so happens that through this lifestyle I've developed an affinity for nuts, many of which are grown in California and are huge water suckers. Living zero-waste is like finding a loose strand of thread on your sweater-- as you begin to pull at it, it begins unraveling. I'll be unraveling forever, and I mean that in the best way. As I begin to think about things in greater depth and seek creative understanding, this lifestyle takes on new meaning. I'm continuously exploring how to live in this world with a lightfoot and give back. This mentality has encouraged me to devote more time to researching the foods I buy and finding out which ones are the most sustainable. We love importing things to America, and fancy nut mixes are definitely on the list. We also grow quite a variety of nuts here in the United States. So the question is, which nuts are the most sustainable? By sustainable I mean, which nuts are the least water intensive to grow, are not harvested and processed through child labor, and are beneficial for the earth. Let's talk about walnuts, almonds, and pistachios which are predominately grown in California and require lots of water. I think we can all agree that the walnut is one of the most unsustainable nuts on the market when it comes to water usage. It takes 4.9 gallons of water to grow one walnut! It takes 1.1 gallons of water to grow a single almond, and .75 gallons to grow a single pistachio. Thank goodness there are other nuts grown in the states! One of the healthiest and most sustainable nuts for me to eat as a California resident is...the hazelnut! If I lived in the Southern states, I'd be eatin' more peeeanuts and peeecans (some of my relatives live in Tennessee). Turkey is the worlds largest producer and exporter of the hazelnut. They are also grown in Italy, Georgia (country), and Azerbaijan. Unfortunately, there have been child labor issues surrounding the cultivation and production of Turkish hazelnuts. Turkish hazelnuts are used to make that delicious chocolate hazelnut spread that I will not mention the name of. Said spread also uses palm oil, which is the main driver of deforestation in Borneo and Sumatra, killing thousands of endemic species like the Orangutan. It's really easy to make our own chocolate hazelnut spread, and in doing so, we won't be contributing to habitat loss and species extinction. For those of you who don't like hazelnuts and live in the United States, organically grown pecans, peanuts, pine nuts, and sunflower seeds (they are used in many similar ways to nuts, in trail mixes, nut butters, etc...) are a more sustainable option over almonds, walnuts, pistachios and cashews. A quick note regarding cashews: while they are quite gentle on the land, they are predominately grown in South East Asia where workers experience human rights violations. It's important to support fair trade organic cashews for this explicit reason. If I didn't like cashews and wanted to indulge in another imported nut, the Brazil nut would be a great choice. Why? Because growing Brazil nuts requires the diversity of the rainforest in order for the trees to thrive and produce...so eating Brazil nuts supports the rainforest and reduces deforestation. Now let me shine some light on this underappreciated nut that's all the rage with squirrels (my mom's dude grows hazelnuts, and the squirrels are obsessed). Hazelnut's are also called filberts. Filbert means, "full beard," which refers to the husk or "beard" that incases the nut. I buy bulk hazelnuts that are organically grown in Oregon by bringing my own reusable cloth bag instead of taking a plastic one. 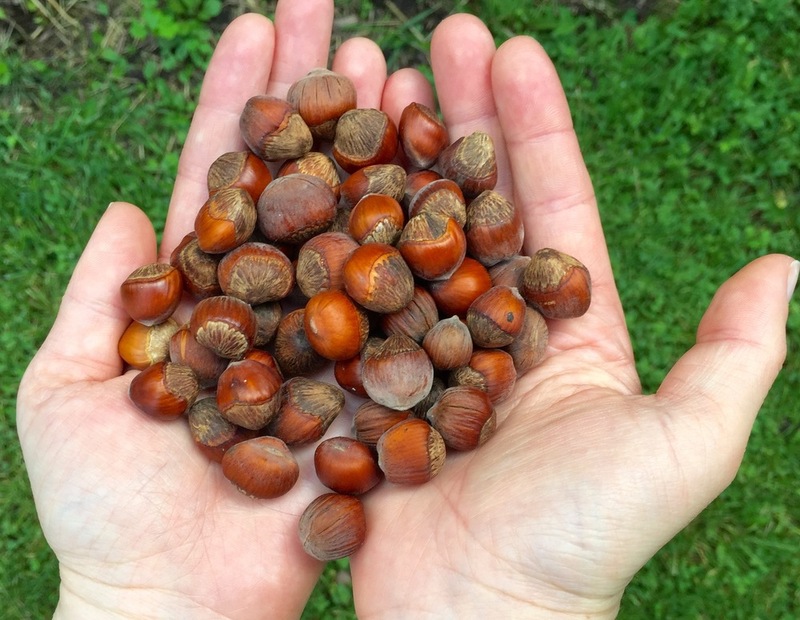 Because Oregon experiences an abundance of rainfall, it's the perfect place to grow hazelnuts on a large scale. They are drought resistant due to extensive root systems. They are effective against soil erosion and leach very little nitrogen. They are a land diverse bush, thriving on slopes or on land that can no longer be tilled. They can produce hazelnuts for over 80 years!